May - And the talk of drought in the South of England appears to be a myth if the last two weeks of the month are anything to go by - Northampton experienced three times the average rainfall for this time of year. The poor weather means another month without getting the balloon flown, we've forgotten what it looks like. This is the final area of the garden that needs attention. At long last we've decided to clear it of rock, weeds and general rubbish in readiness for laying some lawn to blend with the existing grass. As with all things in the garden nothing is easy. 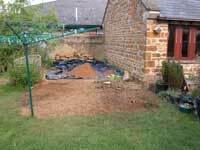 The sub soil is crushed sandstone rock which was laid as a foundation for the drive and prior to that, was a concrete area from the old farmyard and pig pens. Such resistance to change from the very garden itself modifies our behaviour to the point we start something, find it hard going and then stop before we've finished it off. We run the risk of this area not having turf laid until this time next year. We did shift a lot of hold rock, rubble, weeds and soil - enough to fill a one and a half tonne Hippobag. We used these before but from a different company. They are more convenient than hiring a skip and although they don't hold anywhere near as much, they are a lot cheaper. We purchased the bag from B&Q and once it was full we used the internet to pay for and arrange the collection by Hippo Waste. We didn't need to be home and they called within prearranged time. We don't have a great deal more rubbish to get rid of, particularly after nine years of developing the garden. After many years the old, engineering bricks we used to border the flower beds have slowly but surely crumbled away and so we decided to replace them with a double layer of cobbles. We've laid them out to ensure there were sufficient but that is as far as we got. We still need to dig out the turf they are sitting on and bed them in properly. Perhaps this is something we will get round to during June. 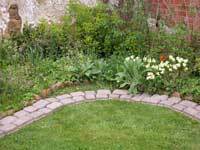 The double width of blocks should stop the grass creeping into the flowers and if laid at the same level as the grass it will mean Steve can run the mower right up to the edge without having to use the strimmer round. The wet end to the month has meant the grass has grown very rapidly and with a few high cuts the grass is looking better than it has done for a long time. The Land Rover Freelander is now five years old and we've had it for the last three and a half. In that time we've increased the mileage from 23k to 60k and so we thought it was time to make a change. It has been reliable in that time but Land Rover hasn't got the best of reputations for reliability so the decision was made. Steve placed an on-line advert on Autotrader for £15 at 21:00 on the Friday evening and by 14:00 the next day the car had been sold. With a deposit from the buyer we then set about transferring the personalised number plates. Before DVLA was computerised this process could be done on the same day but now it takes at least five days and potentially longer. 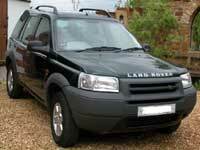 Finally all the paperwork was sorted and we said goodbye to the Freelander. We looked at the Toyota Rav4 and the Honda CRV as possible replacements, we considered new and second-hand. We looked at colours; at deals; at wheels, different sales techniques and pondered all the options over a two month period. Eventually, we opted for a second-hand Honda CRV in silver. It has a slightly larger engine than the Freelander but still manages, in theory, to give the same fuel economy - hopefully 40 mpg. We were irritated by the fact that out of ten colour choices five of them were shades of silver and all but two of them were an additional cost. In our view the paint should be in the price and reduced if you opt for the two colours that nobody wants. These days even black costs more - Henry Ford would be turning in his grave. Towards the end of the month we were visited by friends from Brisbane, Ian & Sue. This is their first visit back to the UK since they emigrated to Australia twenty years ago. Although they have a five week holiday they are packing in a very full itinerary, catching up with relatives, friends and seeing places they have never seen before or wish to revisit. Their first few days were in London and they were pleasantly surprised at how polite people were. They even witnessed a young man offering his seat to an old lady - something we've never seen. The time to worry is when someone offers a seat to you. We had some sunny weather on the Sunday so we persuaded them to go on a cycle ride to Stoke Bruerne. It's a while since either of them had cycled but they took to the idea with surprising enthusiasm. 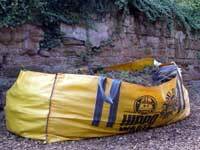 We made it and here they are standing on a dredging barge in front of the Blisworth Tunnel. It is one of the longest tunnels on the Grand Union canal. 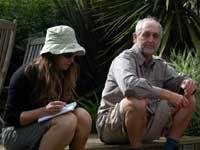 On our return to The Pig Yard we sat in the garden with large mugs of tea and sandwiches resting weary legs. Sue commented that if she'd known we were going to cycle twenty kilometres she would never have gone. It sounds so much less when you say twelve miles. After a good meal our visitors went early to bed and rose early on the spring Bank Holiday before heading off to the West Country and more friends. Ian was going to meet up with a couple of girls he used to go to school on the bus with forty years ago - where would we be without Friends Reunited? 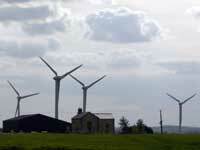 In the past few months the first wind turbines to be installed in Northamptonshire went into electricity production. These are majestic constructions and their grace adds something special to the skyline. There is a lot of resistance to them but we're sure we wouldn't object if they were going to be put up locally. We took Ian and Sue to have a look and managed to find our way to the very base of them without coming across any angry farmers. The web site is full of interesting facts, photographs of the construction and the annual power output expected from the ten turbines that have been installed. We're looking forward to the first time we fly our balloon over them - now that will be very exciting and should produce some exceptional photographs. Watch this space. 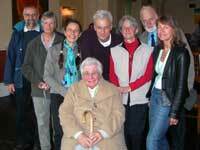 Jane's family experienced a bereavement during the month. Her eighty-nine year old aunt died and so there was a family gathering. Jane's sister, Ruth, travelled from Australia for her favourite aunt's cremation. Before she travelled back there was an opportunity for the family to have a Sunday lunch together. The matriarch of the family sits regally in the centre of the family group. It's a sign of advancing years when the only time families get together is at funerals.